You are here: Home / Emerging trends & STEM / One Week Countdown! 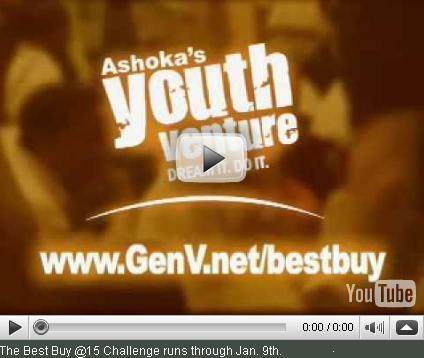 Vote For Your Favorite Ashoka Youth Venture! What better way to kick off the New Year than a quick click to put fresh faces of change to work on the world’s big issues? Ashoka’s Youth Venture, a global network of over 2,000 youth-led teams, picked 30 teen finalists (ages 13-18) to put their plans in motion and make change in the world. Now it’s YOUR turn to vote ‘em up and whittle ‘em down to 15 winning teams of $10K EACH. Tough job. But someone’s gotta do it. I hope it’s YOU! Pick two of these teen projects that matter the most to you, NOW through January 9th based on creativity, community impact, and sustainability. And if you’re really passionate, you can vote once each day until next Friday! Why? Well, as always, there’s a cost benefit analysis to weigh corporate profiteering and cause-marketing, for a win-win component…as I mentioned in the recent interview with PAYJr’s Founder, David Jones. Much like the hipster Virgin Mobile Youth Homeless Awareness widget fueled their cause-marketing campaign in social media, the pooled clout of Best Buy @15 with Ashoka Youth Ventures has the savvy leveraging of credible partner orgs with gear giveaways, contests, incentives and freebie factors that mesmerizes like a dangling cellphone charm. Don’t get me wrong…I believe wholly that industry and nonprofits can (and must!) align in a viable model for sustainability…it’s a matter of whether it passes the “social responsibility sniff test” for enabling REAL action versus lipservice and logo-lending, n’est ce pas? 1.) Funding Factor: This is NOT a paltry prize; $150,000 ($10K EACH for teen teams) can really vault these kids into using philanthropic power early on, similar to IdeaBlob’s monthly passion projects I wrote about here. Further, through the @15 Fund.org fund Best Buy places the power in the hands of teens to DONATE $500 to their school or favorite nonprofit AND according to their site, (complete with Magic Johnson video/endorsement) there’s funding available through this partnership beyond the 15 big ticket causes for an additional 300 youth-led Venture Teams in the United States. 2.) Partner Cred: I don’t know about you, but I immediately click to see the logos of who else is involved when I’m doin’ my sniff tests. This effort could be a micro-snapshot of what I’d welcome for Shaping Youth’s own alliances. LOOK at all these relevant educator hubs and advocacy orgs, peppered with techno-cool advancements and 21st century entrepreneurial skill sets via @15. Enticing. 3.) Project Relevance: Is it fluff-n-stuff or easy to act upon? I love the one click concept of youth empowerment to get the ball rolling, knowing full well the support system needs to be in place to rollout the bigger picture. “The more other youth learn about the current @15 finalists, the more likely they are to start their own social ventures and become changemakers in their own communities,” said Gretchen Zucker, Executive Director of Youth Venture. “I am truly inspired by the ‘Best Buy @15’ finalists — they’ve all demonstrated such an entrepreneurial passion and commitment to their projects,” said Liba Rubenstein, manager of Public Affairs for MySpace and co-founder of MySpace IMPACT. Sure there’s a halo, and why not, with that kind of platform to connect with young teens, and the financial clout and resources they’ve put forth to support them? 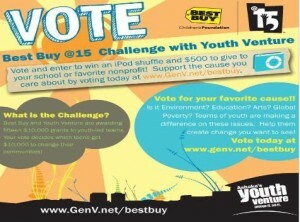 But to me, Best Buy @15 Challenge and Ashoka Youth Ventures gets a hallpass. 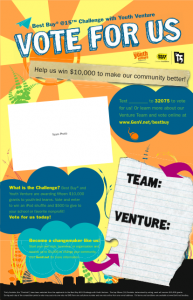 And…Don’t forget to vote for the Ashoka Youth Ventures Best [email protected]! Quick Picks: At A Glance Slideshare of Ashoka Finalists: Vote Now! Great way to start the New Year with hope and promise, eh? Go to it, youth! Dream it. Do it.